Synonyms: Annona arenaria, Annona chrysophylla, Annona porpetac. African custard apple is a native to Western and Southern Africa ranging from Senegal to South Africa. 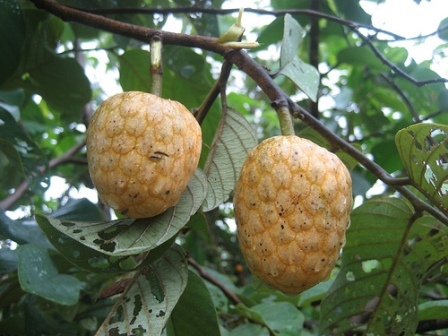 The fruits are eaten in large quantities by the local people. Wild trees of are mostly found in semi-arid to subhumid regions occurring along riverbanks, fallow land, swamp forests and at the coast. Besides Africa, this fruit is also found in South India. A large shrub or small tree 2-6 m tall but may reach 11 m under favourable conditions; bark smooth to roughish, silvery grey or grey-brown, with leaf scars and roughly circular flakes exposing paler patches of under bark. Young branches with dense, brown, yellow or grey hairs that are lost later. Leaves alternate, simple, oblong, ovate or elliptic, 6-18.5 x 2.5-11.5 cm, green to bluish-green, almost without hairs on top, but often with brownish hairs on underside, net veining green to reddish on both surfaces; apex rounded or slightly notched; base square to slightly lobed; margin entire; petiole short, 0.5-2.5 cm, thickset. Flowers up to 3 cm in diameter, on stalks 2 cm long, solitary or in groups of 2-4, arising above the leaf axils; 6 fleshy cream to yellow petals in 2 whorls, greenish outside, creamy or crimson, 0.8-1.5 x 0.9-1.1 cm, glabrous or minutely papillose within; inner whorl of the petals curving over the stamens and ovary; sepals ovate, 3 in number, free, smaller than the petals, 3-4 x 4-5 mm; stamens 1.7-2.5 mm long. Seeds numerous, cylindrical, oblong, orange-brown. The fruits of African custard apple are popularly eaten by people. These are also also offered for sale. Besides providing edible fruits, this tree has several other uses too. The leaf tips and bark are used to treat colds and pneumonia. 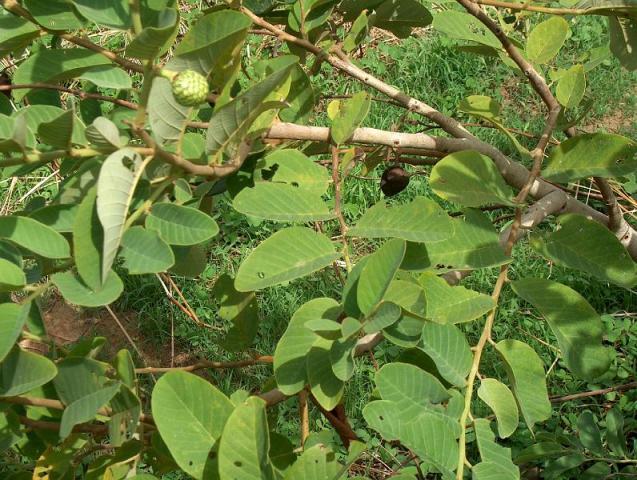 The fruits are used against diarrhea, dysentery and vomiting, and the root is also used for stomach problems. The bark is prepared to treat intestinal worms as well as dysenteries and the gum is used to seal cuts. 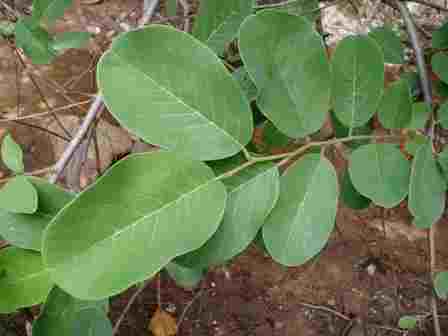 The leaves are sometimes used as fodder and are browsed by elephants. A perfume is also extracted from leaves in Sudan. African custard apple can grow upto an altitude of 2400 m in tropics. The preferred annual mean temperature range is 17-30 C and the annual rainfall between 70 to 250 cm. There does not seem to any preference for specific kind of soil. Propagation is mostly by seed. Root suckers can also be used. This tree grows moderately fast. The only major disease affecting African custard apple is anthracnose. It is caused by Colletotrichum gloeosporioides. and induces small, light green spots on leaves and dark spots on flowers, causing them to drop prematurely and leading to mummification of the fruit. It can be easily controlled by timely application of suitable fungicides. The other problem, though not prevalent at all locations, is the cracking of fruits.